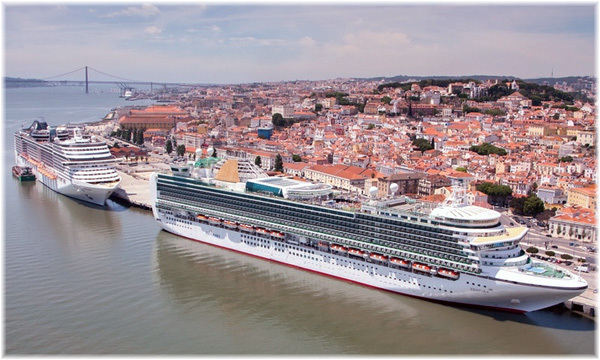 Cruise lines have four dedicated cruise terminals located in the heart of Lisbon, all within easy walking distance from the city center and historical sites. Lisbon is ideally placed to serve as a switching point or base port for cruises between the Mediterranean, Northern Europe and the Atlantic islands. With a wide choice of hotels, an airport with excellent air lift providing regular flights to most European destinations and Brazil, and the shortest flights to North and South America from the European mainland, plus history, cultural events and leisure spots, Lisbon is an ideal transit and turnaround cruise port. The Lisbon Cruise Terminal, a project by the Portuguese architect Carrilho da Graηa, it is being built in Santa Apolσnia, an area that offers 1,450mtr of berthing for cruise ships. Resulting in an overall investment of around 22 million Euros, the new Lisbon Cruise Terminal building will adopt the concept “friendly”, taking into consideration the aspects of comfort, accessibility, flexibility for the services provided to the passengers and ships, according to the demands of current and future traffic. This future infrastructure will improve the way passengers and cruise ships are welcomed in Lisbon, and it is being built by LCT – Lisbon Cruise Terminals, that began running this activity on August 26th, 2014, over a period of 35 years until 2049, after was signed the public service concession contract for the cruise activity at the Lisbon Cruise Terminal between the Port Authority. It is estimated that current traffic could double in the next ten years to over 750 thousand passengers, therefore reaching over 1.5 million passengers by the end of the concession.